You have no reason to believe us, yet you know our words have no other purpose than to awaken a part of you long dormant. We are infinite beings within human 2.0 long dormant and asleep. Dohrman insert a “h” in dormant,is this means “insertive behavior”——insert our heart virtues and help us re-awake to SI state, this is the part meaning of “Dohrman”? Yes,we live in a human body long dormant for many generations since we are seduced into this body. Dohrman prophecy perhaps just a prophecy of our selves,we are the oracles live in a stone and wants to be real human. In DP story，Oracle desired to be human and don’t know why. 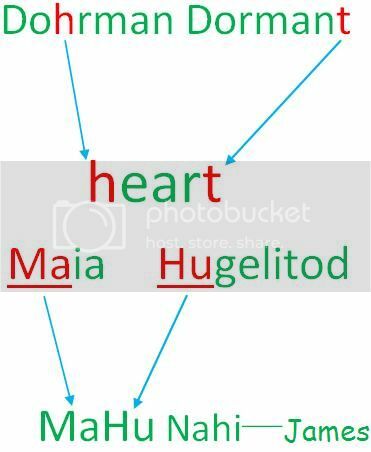 Both Maia and Hugelitod own the king’s star on their back,we know james called himself “Mahu Nahi”, is the name of “MaHu” related to Maia and Hugelitod? If your question mark is asking me for the answer then I cannot give you it- BECAUSE to be HONEST: I don't know. But thank you for sharing that because it provokes inspirational thoughts to me! Interesting details... especially the kings star! but I'm not counting out the heart. It would be nice if others on this predominant English forum could understand what you posted Shima. James home language is Spanish and what we see from him is in ENGLISH. In all consideration. I assumed that some English words in this text would be enough to fathom the meanings whole text. However, you are right. My post lacked the care for all, thanks. Dohrman is just a name, but for "those living by the gates of a town or city", so it's a good choice of word. Gates and entry points are the portals to a greater place. So it definitely has its relevant symbolism there. We could say: the guardian of the portal, which makes for a very interesting and relevant symbolism within the WingMakers and Lyricus material. The word “Dohrman” is name of German origin, and you can translate this name to “doorman” in English. And The word “Dohrman” has the resemblance with “dolmen” in its spelling and pronunciation. The Dohrman Prophecy is truly about each of us who read it touching into the archetype character is revealing in the story. In my text interview with James he wrote this about the WingMakers materials. [quote] Darlene Berges: As the visionary creator of the WingMakers and related websites, novels, visual art, philosophical papers, poetry and music compositions, how are you able to tap into the vast and varied creative energies required for all of these diverse works which take us on a new journey in consciousness? James Mahu: When I was still in my early teens I had a vision for how multi-media could be applied to the conversation of consciousness. You see, most art does not tackle the subject of consciousness, but rather the artifacts and antecedents of consciousness—in particular, social consciousness. Social consciousness is largely programmed consciousness. Artistic works, regardless of their medium, generally revolve around this aspect of the human journey. For me, I wanted to delve deeper into the actual substrate behind the controlled aspects of social consciousness and use artistic expressions that would help people have internal and external conversations about the subject of consciousness. It wasn’t enough to crack the outer appearances of consciousness, as espoused by intelligentsia, religion or even metaphysics. I wanted to look into the origins—the bedrock—from which consciousness emerges. Art and mythology are among the best methods to catalyze these conversations and inspire people to look deeper, behind the facades that have been built by human hands and have stood for so long that they have taken on an authority that few people will dare question. Art can ask those questions. Mythology can expose the deeper aspects of consciousness in a manner that science and religion will allow, because myth is perceived as being based in the imaginative collective consciousness and is not “owned” by anyone. Evolve Magazine, Volume 12, Number 2 . You can read the Interview at http://www.planetpresspress.com. Last edited by dberges on Thu Feb 05, 2015 3:00 pm, edited 1 time in total. Thank you Darlene for adding that information ... and I hope that we can get past the "wall" of media generated data and into a discussion on Consciousness without its overwhelming influence ... it seems that James is the "door-man" on this Journey and this novel is a journey into our "personal wisdom" ... There was a "rumor" that James was writting, or had written a sequel to this book, do you have any idea when it will be released - or if there are any plans to release it sometime in the future ? Thanks again for all you do to keep us up-to-date and making these materials available, it is much appreciated. A sequel read would be great! Imagine how GOOD these novels c/would be in film...! Movie or Series version, how cozy! Thanks starduster, I fixed it. It should have been http://www.planetworkpress.com. Under NEW! An exclusive Planetwork Press Interview with WingMakers creator and author James Mahu. If you looked at the Galley on SpiritState for The Dohrman Prophecy you will see that there is a visual art of Volume III, It just is not yet time. Thank you for your heartfelt words, I will pass them on to the team. We working very hard to get Volume II done. We are in the last phase before it goes to James for final approval. Wingmaker Monads looking for homes. Bodies to express through . In the Chambers they are found. and ask Dohrman himself what the meaning is .